Said to be named after the first chancellor of the German Empire, Otto von Bismarck, the entire Latin name honors him with “nobilis” meaning ‘noble’ at the end. Otto maintained peace between the German states during his lifetime, creating the first welfare state in history and maintaining loyal support for 30 years during the height of his service. Tough and stately, Otto in himself characterizes many of the things we love about the Bismarck palm today. If you want a palm that gets the job done right in the landscape and you have plenty of room, look no further than the Bismarck Palm. Very different from many other palms, the look and shape of this palm is pretty amazing. Stout and wide, in cultivation this palm grows no more than about 12 metres in height, and overall just as wide – maybe wider. A central, leafless and branchless trunk forms with a mound of gigantic round leaf fronds held up and out in a crown that’s round in shape. While the silvery-blue varieties are the most popular and cold tolerant, there are green varieties although not as common. 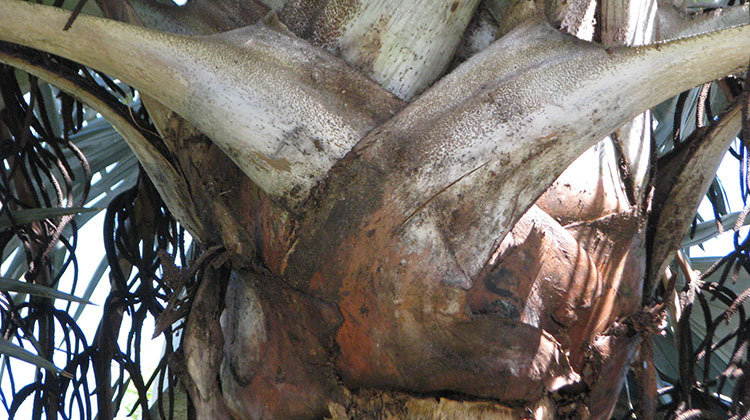 Trunks are stout and wide and shed stems and leaves from the base up to the youngest part of the palm. Trunks will often be fluted at the bottom. They do not self-clean when young but do shed their expired fronds when mature. 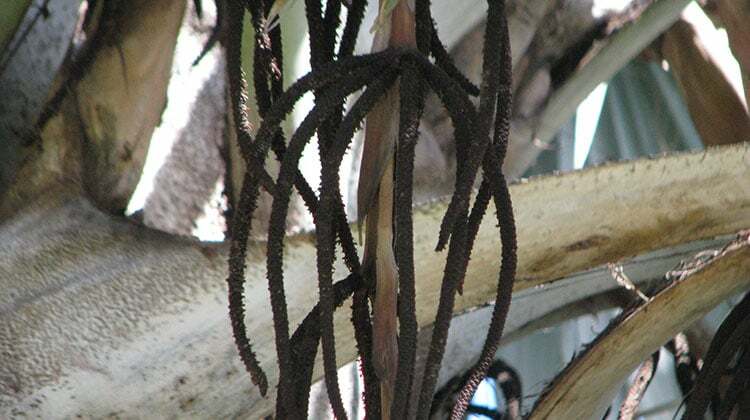 This palm is dioecious so each plant is either a male or female. Both palms flower of course, with brown, pendent inflorescences. The flowers are pretty unremarkable in both male and female palms, as they are very small and not showy. 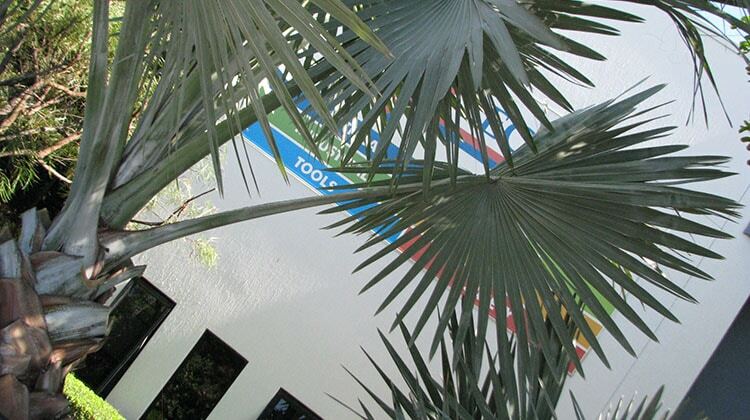 The most striking feature about this palm is its foliage. In mature palms, each leaf can be over 3 metres across, and is rounded in overall shape. Each leaf sports 20 or more hard and stiff blades that are split on the ends. The sides of each frond are so sharp they can cut skin though they don’t have spikes. Only the females of this palm set fruit. From each flower they develop a single stone fruit that is green when new and turns to brown as it dries. It’s not really an edible fruit, for either people or animals. Thankfully it’s not a messy landscape fruit either. Bismarckia is easily started from fresh seed, like many other palms. Removing the fruit flesh from the outside of each seed and planting deep in well prepared soil and kept warm and moist is a typical method of propagation. The Bismarck Palm is a tough customer and can be grown just about anywhere that gives it plenty of room and space to spread out. 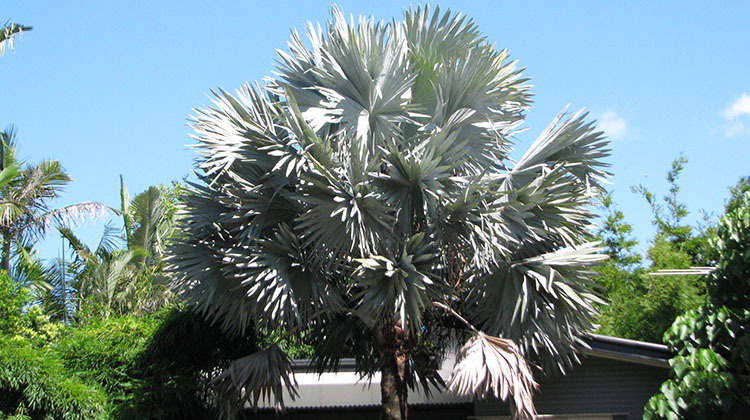 It requires full sun exposure but can be grown in soil that is moister and less well draining than other palms, although it does well in most all soil types, even dry ones. They thrive in tropical and subtropical climates, and can withstand some amount of freezing in protected temperate areas. The plants that have the white/blue cast can withstand colder temperatures than the green plants typically, which makes these the more popular choice in landscapes. The primary problem I see with Bismarckias is being planted too close to houses, driveways, fences or anything else. They have a huge spread which is easy to underestimate. They can’t be neatly pruned so the palm becomes redundant, requiring removal. This is just one occasion when a plan of a property that includes trees is helpful. They can be used as specimen plants, anchoring trees, windbreaks, and screens. They are a wonderful staple in the landscape. On the other hand they are very often planted too close to houses and other structures. Generous allowance needs to be made for their huge spread. Hi our neighbour has a huge Bismarck tree currently fruiting we constantly get a smelly odour at that area. Could it be his tree, only smells bad in summer time. Hi George, and thanks for asking. It could be his tree, but if it is it will be because of a pathogen. In a bismarck palm I’d suggest a fungal pathogen called Phytophthera is the most likely cause. If anything could be damaged from the tree failing (breaking above the root system, in this case) then it should be assessed by a level 5 arborist. Let me know if I can help, if you’re in Brisbane. I have a 2 story high Bismark in great condition. Can supply a photo. Anyone looking to purchase? Hi Tristan. We’re in Brisbane with a yard at Archerfield and at Goodna. We service much of south Brisbane and north to around Clayfield. I’m replying a few months later. Do you still have your Bismark available? We have a large Bismark, approx 8 meters tall and trunk at base 1 meter diameter. Are you still looking? We have a Bismarck that is approximately 12 years old. It is planted very close to driveway & house (currently the trunk is approx 7 foot away). Should we look at having it removed? Hi Shell. If your house is built on a slab then, sorry, but yes. 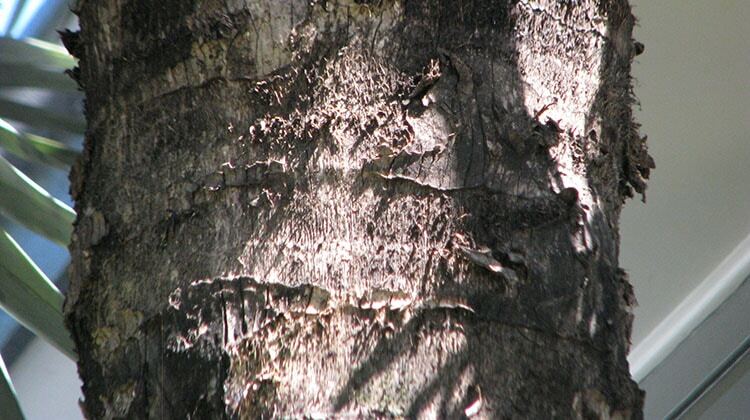 The palm roots will be growing against the slab and growing along your house giving access to termites. If they are under the slab then during drought the roots will contract causing soil subsidence. We protect trees when we can but in this case I recommend removal. Hi i have 2 of these huge palm trees at my home in south west Brisbane and i must say as Nice as they look you need to either be a full time gardener or allow a budget of around $50 a month to maintain them. They shed these huge branches constantly that are next to impossible to cut up and dispose of. Having recently purchased the house without this knowledge im now trying to decide what to do with them as i can afford the time or money to maintain. My question can they be sold and relocated? Or will they ever stop dropping their branches or is this constant and all year round. Thanks. I have a beautiful in-ground bismarck palm available for removal and relocation! Please get in touch if you’d like to see a photo and are interested in this great opportunity. Is your Bismark still available? keen! At maturity do these palms keep losing their fronds? Mine is well above 12 metres high.